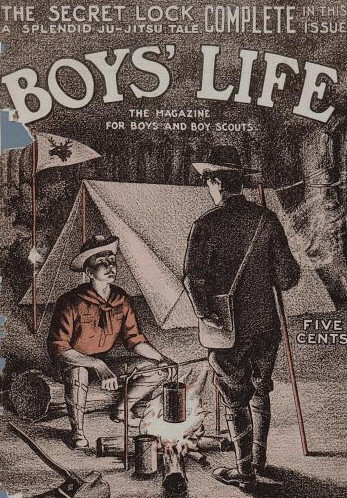 Editor’s note: In 1911, the first edition of Boys’ Life magazine was published. 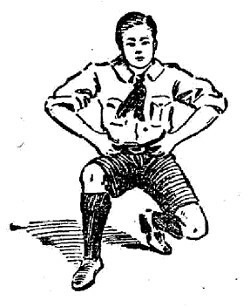 The first several issues included a short-lived section called “Things All Scouts Should Know,” which featured short, practical tips for boys at home and out camping. Below is a collection of my favorites; some are actually practical and handy, others just fun and interesting, and all are enjoyable to read. If you ever find yourself in the unfortunate predicament of the Irishman who was “hanging between nothing and space” with only a rope to hold on to, you should be able to form quite a comfortable little seat if you hold the rope as depicted in this sketch. All you have to do is to hang on for a moment or two with your left hand, catch the end of the rope with the right, and bring it up under you in the form of a loop. Then grip both the end and the rope itself together, and you will find yourself sitting in the loop, and easily able to support your own weight. Tweezers are a thing one rarely sees about, and they are always not in evidence when required; that is, when one is unfortunate enough to run a splinter into one’s hand. 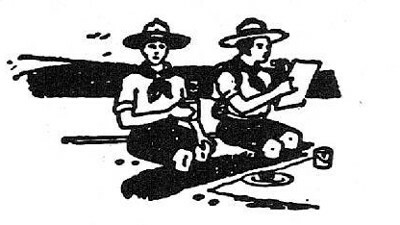 When scouting, one is always liable to get thorns and splinters into the flesh, and if one carries a pen-nib on one’s person it will be found the best of tweezers. 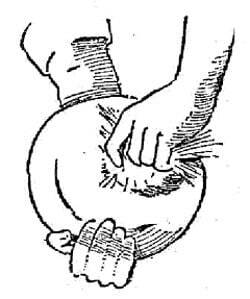 In the illustration, a hand in which a splinter has entered is shown, and this is the method by which it is ejected. Press the nib firmly at B, just in front of the splinter, when it will open. 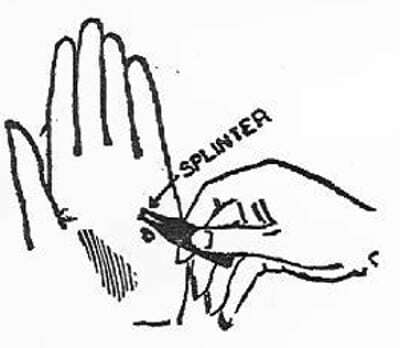 See that the splinter is between the two divisions, then press the nib along each side of the splinter and let it close up. The splinter will come out without any trouble. You may have occasion at one time or another to hoist some heavy article from one place to another. 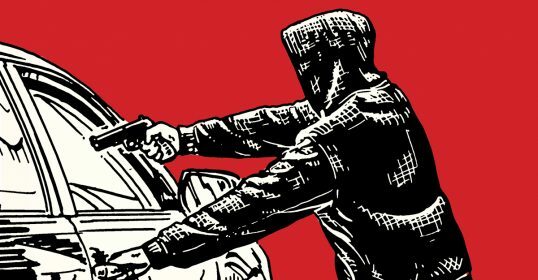 If you are doing this by means of a hook, you should know the correct way of roping the article on to the hook. 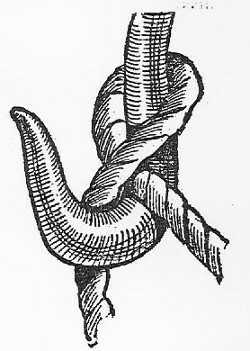 A “Blackwell Hitch” should be used, and this is simply and quickly made by looping the rope over the hook, as it is not nearly so likely to slip. 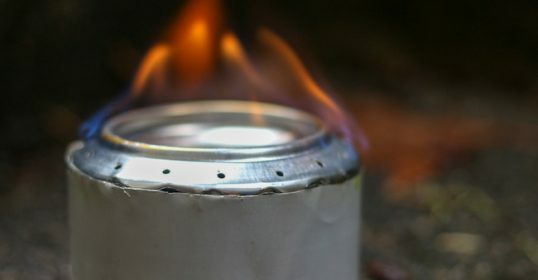 Greasy plates are hard to clean without hot water, and when out scouting, or in camp, boiling water is not always easy to obtain. A tuft of grass with damp earth adhering to it is a good substitute. Rub the earth well over the plate, and it will soon remove the grease. Then rinse the plate in cold water, and it will be perfectly clean. Failing sand, earth will also clean grease or oil out of bottles. An uncovered signal light displayed on the top of a hill is, of course, in the very finest position for being blown out by the wind. On the other hand, when you want to make use of such a light, a glass-protected lantern is not always at hand. But a candle, or a piece of one, and an empty bottle are generally to be obtained, and with those you can get along very famously if you know how, even on the very gustiest of nights. Break off the bottom of the glass bottle, which should be without a cork. 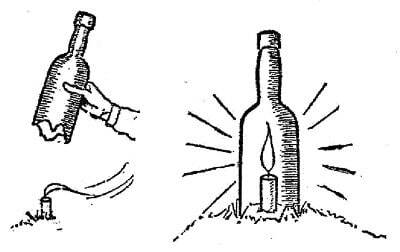 Plant the candle in the ground, light it, and quickly pop the bottle over it, pressing the latter down firmly into the earth. There you have a cheery little beacon, that will shine out and not blow out, no matter how the gale rages. Many people soil the binding of new books by carelessly opening them. The proper way to open a volume when it is new is to place it with its back on the table and then to let both the board covers gently down while holding the leaves in one hand. Then open a few leaves at the front, then a few at the back, until the center is reached. By going slowly like this the first two or three times the book is opened, you will make it last much longer than you would by opening it in a great hurry. The simple contrivance that is known as the camp night-light, is one that often proves handy for camping out. It is formed of a small tin without a lid, and half-filled with fine earth. Upon this are melted any odd ends of candle, until a fair thickness of tallow has been obtained. 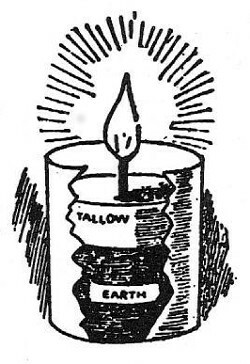 A thin, dry stick neatly wrapped round with a piece of say, calico, is then pushed down through the tallow and earth, right down to the bottom of the tin. When this wick is lighted, the camp night-light sheds a modest but useful glow all around. And, of course, there is no oil to get dangerously upset or spilling about, to spoil things. When hot water is poured into a glass, the latter is very likely to crack if precautions are not taken. 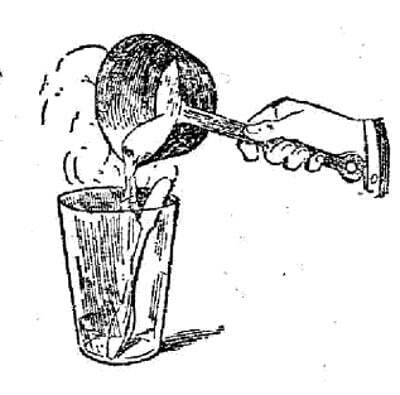 To prevent the glass from breaking, you should place a spoon in it and let the hot liquid run down the metal, as shown in the illustration. This will take the heat away from the glass, and so enable you to keep your store of glass intact. Every Scout is on terms of great familiarity with the egg. Camp life without it would not seem like camp life, for does not the egg fill one of the most important roles in the menu? Boiled in a few minutes it is a handy thing when there is a rush on, and it can be made the backbone of many a tasty dish. No wonder that it is an autocrat of the camp. But, boiled in a billy-can it can give the boiler something to think about. It’s a very easy thing to drop an egg into a billy-can full of water, but it’s not such an easy matter to get it out. A spoon of no mean size is required to manipulate the egg. 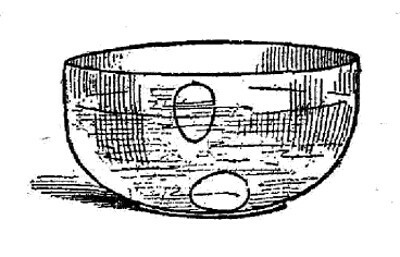 To save time and trouble in boiling an egg, a Scout, having experienced the above difficulties, has constructed the egg-holder shown in the diagram. It is made of wire, spiral-shaped at one end to contain the egg, and with a hook at the other to fasten on the side of the can. In this way the egg is held fast while boiling so that it can be easily removed from the billy when it is done by lifting the hook. Some people when they wish to hide anything go to a great deal of trouble. The chimney is now too well known for absolute security, so digging in the ground in the coal cellar or some such place is resorted to. There is not the slightest reason to make such a fuss, for the best place to hide anything is in an object which does not seem to offer any scope as a hiding place. Soldiers seem to have realized this, and it is said that when “Tommy Atkins” received his money he used to make a hole in a bar of soap, place the coins in the middle, as shown in the illustration, and seal up the end by banging the bar down on something hard. Who would think of looking for anything in such a place? Tobacco has been smuggled into this country in imported broom handles and lady smugglers used to cross the Atlantic with babies who were never known to cry. The reason was made apparent when it was discovered that the babies consisted of lace and other contraband articles. So when you want to hide something give a simple hiding place a preference. For fastening a rope upon which strain is to be placed, a picket, or sharp stake, like a big tent-peg, is commonly used. But, if the strain is great, or if the only pickets you have handy happen to be small, it may be necessary to make a holdfast for the purpose. This is constructed of three pickets, driven into the ground at a slope, one directly behind the other, and the top of each one lashed to the lower part of the picket behind it, as shown. Such a holdfast should be neatly put together, and it will then withstand a tremendous strain on the rope. Here is something more about the egg, much more important than the boiling question. It is to see whether it is worth boiling or not. No one but a person unpossessed of the sense of smell can mistake a bad egg when it is opened, and the most unfortunate individual is he who has opened it and perhaps carried the first spoonful in the direction of the nose. The difference between a fresh and a stale egg can be detected, however, the moment they are put in the water for boiling the fresh egg immediately sinks to the bottom and lays flat upon its side, whereas, the stale egg will be seen to rise on end. If it rises slightly it may only be a trifle stale, but according to the angle at which it inclines with the bottom of the saucepan, its staleness can be told. If it rises to the top, as shown in the illustration — well, take it out to the dust bin, but be careful not to break it. One disadvantage to our camp boiling receptacle, described above, is that it prevents the testing of the egg in its boiling water, and in this case it is advisable to test the egg in a fairly shallow vessel beforehand, or with cold water in the billy-can. There is a right and a wrong way of doing everything, even to the flattening of a projecting nail. The usual way this is done is shown in Fig. 1, and, although it may be flattened down a little more than is shown in the illustration, the method is wrong and the point is always liable to catch in everything it comes into contact with. 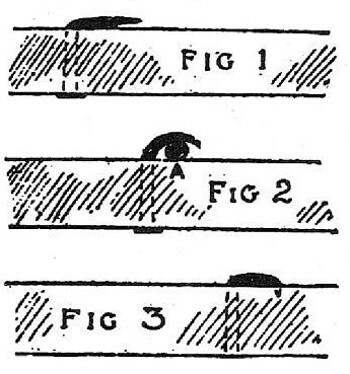 The proper way to flatten the nail down is to place some thin circular object, such as a piece of wire (A), under the projection when hammering down (Fig. 2). 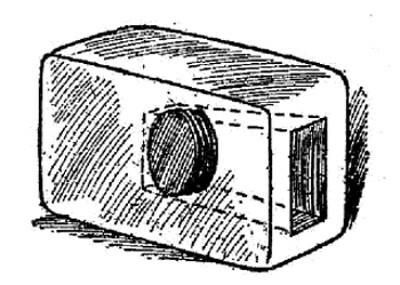 This has the effect of turning the point round so that when it is finally hammered flush with the wood (Fig. 3), the point will be driven in, instead of being dangerously turned out. 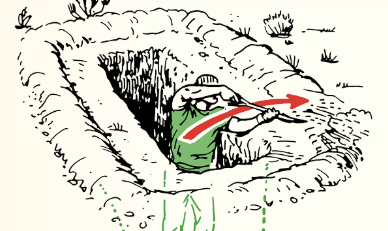 Dig a fair sized oval trench about two feet deep, leaving an oblong space in the center, which forms the table, and then sit round on the ground, with your legs in the trench, and your plates of food in front of you, as shown in the illustration. Many Scouts, no doubt, find it difficult to keep a jersey, or sweater, neatly and securely rolled. Here is a method which will overcome this difficulty, and make it quite easy to strap the jersey on to the belt. First lay it out flat, as in Fig. 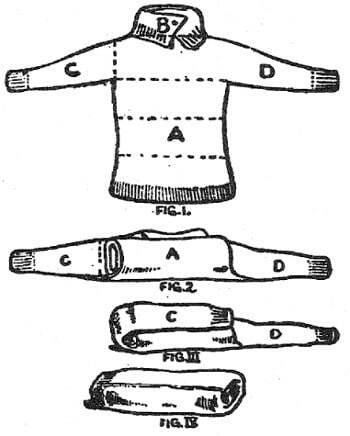 1, folding over the collar B, at the neck. 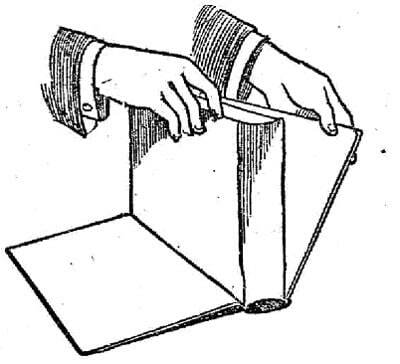 Then fold over the body, A, three times, as shown by the dotted lines. The jersey should then assume the appearance of Fig. 2. Next turn the sleeve, C, over the body, A, as in Fig. 3, and then pull the arm, D, over the body and other sleeve, turning it inside out for that purpose, after the fashion in which you roll a pair of stockings together. The result, as shown in Fig. 4, is a neat oval roll, which can be easily and comfortably strapped on to your belt. One of the most annoying things that can happen when you are running is to feel that unpleasant pain in the side known as the stitch. 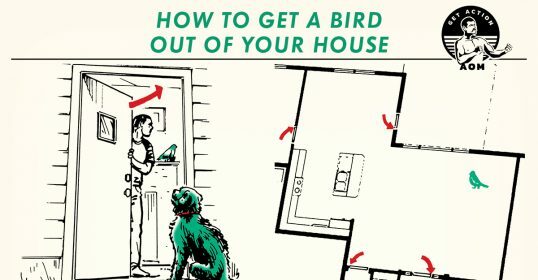 The accompanying illustration shows a quick and easy cure for this annoyance. Bend down in the manner shown, place your hands on your hips, with thumbs to the rear, and then start walking along in this undignified position. When you have proceeded a few yards, then get up again and you will find that the pain has disappeared. Do you have any camping/scouting hacks that you learned as a youngster? Share them with us in the comments!